Author: Anthony, Ronald Set In . . .
Do you believe that love can last forever? Jesse Sienna doesn't. His own parents' marriage was caring, but passionless, and his own romantic history tells him that love burns brightest before fizzling out completely. So when his elderly father, Mickey, moves in with him and seems unable to understand Jesse's no-strings-attached relationship with his current girlfriend, Jesse barely pays attention. It's just another example of how different they are-and more evidence that he and his father will never connect on any meaningful level. But the truth is, Mickey Sienna knows more about love than most people learn in a lifetime. More than half a century ago, he found the truest love that life can offer. He knows the endless rewards of investing your heart and soul in someone . . . and he knows the devastating costs of letting that perfect someone slip by. When Mickey sees Jesse taking an extraordinary woman for granted, he decides it's time to tell Jesse his story-a story he's never shared with any of his children before. Over the course of the next few months, Mickey explains his most private and fulfilling moments to his youngest son . . . and forever changes Jesse's perception of love and the possibilities of a lasting relationship. 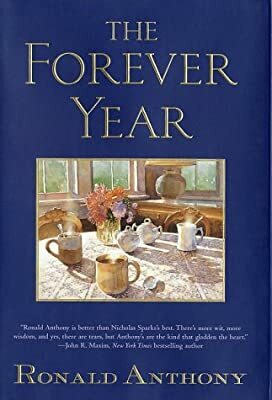 At once a stirring family drama and a touching romance, The Forever Year is filled with richly drawn characters and powerful situations. You will respond personally to the people you meet in this novel, and you will find yourself deeply enmeshed in their stories. And you might find yourself looking at love in a new way.